This elegant and stately figure of the Hindu god Shiva, a major god of the Hindu trinity, reflects the importance of the Indian influence in Southeast Asia. It reveals the extent to which trade mobilised ideas and shaped cultures in Southeast Asia, bringing new influences into the region. The founders of the Cham dynasty brought together an already Indianised culture and adopted Shiva as the patron deity and emblem of their people. Shiva was revered as the founder and protector of Champa, the primacy of this god being established by one of the earliest Cham rulers, Bhadravarman I at the important religious centre of My Son. This sculpture of a seated Shiva from My Son, dating to around the 9th or 10th century, represents a high point of Cham art and culture, and represents the resurgence of Shaivism as the primary religion of Champa after a period of Buddhist dominance. This elegant sculpture depicts the powerful god in a relaxed yet stately posture, seated cross-legged on a stepped pedestal, with his vehicle, the bull Nandi kneeling before him. His broad, squarish face is crowned by a three-tiered 'jata' (chignon) which helps to date the sculpture stylistically. Other ornaments include an elaborate neckpiece, armbands and the Brahamin's sacred thread in the form of a 'naga' cord worn across his chest. 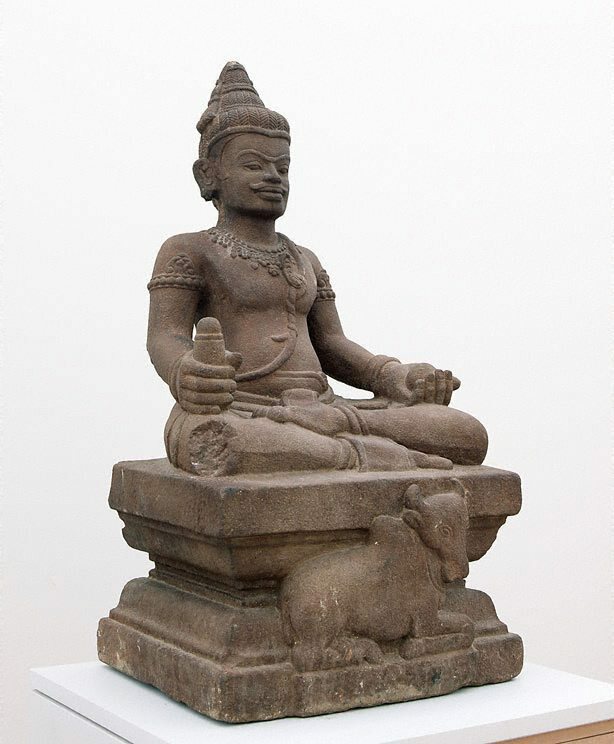 This sculpture is a particularly elegant example of the diverse influences that have informed the development of Cham art, the distinctive moustachioed face and the regal bearing of the deity being suggestive of the hieratic figures produced by the Khmer culture. 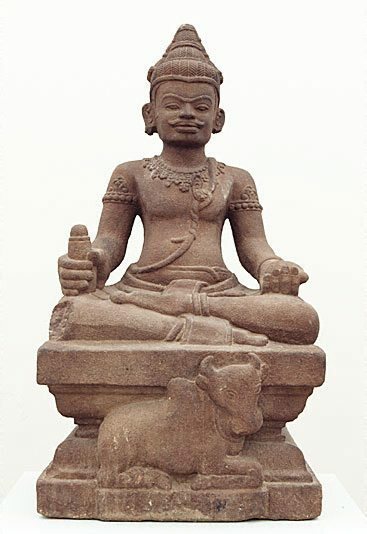 However, the relaxed, slightly fleshy softness of the deity's body and his distinctive seated posture reveals the kinship of Cham sculpture to Javanese forms. Yet despite these recognisable influences this sculpture is wholly unique and represents Cham art at its zenith: the figure being balanced in form and proportion, the deity appearing naturalistic yet noble. This sculpture is an exceptional example of Cham art. Asian Art Department, AGNSW, October 2002. The Asian Collections Art Gallery of New South Wales , Sydney, 2003, 299 (colour illus. ).